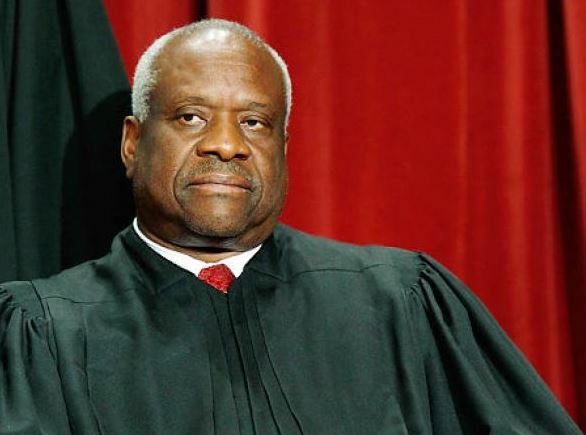 Supreme Court Justice Clarence Thomas said Monday his colleagues turned down a worthwhile case. A group called Upstate Citizens for Equality brought the underlying challenge after the federal government took 13,000 acres of central New York property into trust for the Oneida Nation, one of Five Nations of the Iroquois Confederacy. Joining forces with six private citizens and the New York towns of Vernon and Verona, the challengers fought the government’s action as an unconstitutional exercise of the Indian Reorganization Act. An appointee of former President George H.W. Bush, Thomas complained that his colleagues are missing an opportunity to right precedents on the Indian Reorganization Act that have gone awry. Thomas said the extension of Supreme Court precedents would shock the Framers, hypothesizing that Congress could wield such power to strip a state of almost all sovereign power over land it would give to Indians. “This means Congress could reduce a state to near nonexistence by taking all land within its borders and declaring it sovereign Indian territory,” Thomas continued. “When our precedents permit such an absurd result, something has gone seriously awry,” the opinion concludes. “It is time to fix our error. We should have granted certiorari to reexamine our Indian Commerce Clause precedents, instead of standing idly by as Congress, the executive, and the lower courts stray further and further from the Constitution. I respectfully dissent from the denials of certiorari. Frank Kowalkowski, of the firm Von Briesen & Roper in Green Bay, Wisconsin, represents the towns of Vernon and Verona. Reacting to the denial of certiorari, Kowalkowski said that the ever-growing application of the Indian Reorganization Act is causing hardships on state governments that cannot be overstated. “Justice Thomas’ strong dissent aptly demonstrates why the town believed United States Supreme Court review was warranted,” Kowalkowski said in an email. “It is truly unfortunate that a majority of the court did not agree that it was time for a detailed analysis of the Indian Commerce Clause and the laws enacted by Congress under its purported authority,” the attorney added. “The federal government has created a new two-tiered system that will render all nontribal Indians mere second-class citizens in a brave new world controlled by unelected federal bureaucrats and tribal leaders,” said Vickers, of Fayetteville, New York. The group Citizens Equal Rights Foundation had a dog in this fight as well, having filed an amicus brief and launched a separate case with Central New York Fair Business and the Citizens Equal Rights Association. Lana Marcussen, an attorney for the foundation, said the dissent by Justice Thomas will guide a future challenge. “We hope that the community in and around the affected area will be emboldened by Judge Thomas and support a new suit challenging tribal and federal jurisdiction over the area taken into trust,” Marcussen said in an email. Representatives for the government have not returned an email seeking comment. The Oneida case was among dozens to which the Supreme Court denied certiorari on Monday.